On May 12th, the crew of Sionna crossed back into Maine by land, having covered in 4 days the distance it took them 5 months to traverse by sea. Trust me, the sea-version was a lot more fun, and interesting! July 2016 – Moved into a 36 foot RV in Rockport Maine while we finished readying the boat for a long cruise. We did, and it was good. We did that too. I never expected to spend 2 months anchored/moored in Marath noon, Florida (Boot Key Harbor) but that’s what happened, and all in all, it was ok. I (Keith) wouldn’t choose to stay there so long another time, though. Spring 2017 – Leave the boat in Florida someplace safe, and fly back to Maine – and our RV – for the summer to work for cruising chips. The boat is safely stored in a yard near Placida, Florida, as secure from hurricane and vandal as we can make her, and we’ve driven back to Maine, for work eventually, but first to finish the saga of the retinal detachment begun last October in Hampton, VA. Three more procedures, and Keith should have two eyes again. Fall-Winter 2017-’18 – return to Sionna in Florida, and cross to the Bahamas until Spring. And that’s still the plan! After that, we have absolutely no idea. Noise has been made about bringing Sionna back north from the Bahamas, but we’ll see where we end up. Remember: If you’re not living on the edge, you’re taking up too much space! Your about 5 years ahead of me, but I’ll catch up! Thanks, and welcome on the journey! Every day we learn a little more. Used to live in Florida and I’ve been to the Bahamas. That sounds like a lovely plan, indeed. I went to college in FL, but looking forward to missing a couple Maine winters! Thanks for stopping in. What a marvelous plan! Bon voyage. So do we, but you know, it’s SNOWING here today! Only way I can look outside without crying is by reminding myself that this is likely our LAST snow for the next three years! That’s even more powerful than melting butter. Remember, 1.2 meters is your magic number! Anywhere the chart says 1.2 you are good to go! Best of luck, should be an enjoyable trip as you have planned the timing well. 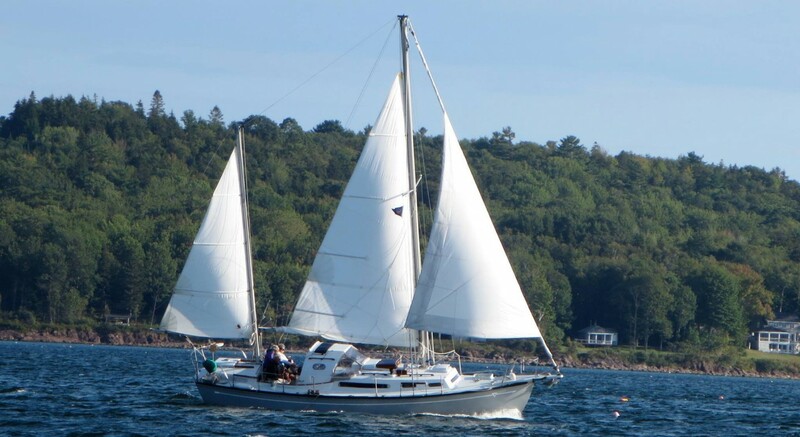 I sail a 1964 triangle 32 pilothouse sloop. I am located in Fernandina Beach Florida. Lived on the boat for 5 years, but just bought a house. Would like to see your boat if your passing through and I am around. Fernandina is a great stop so plan on it. I have sailed the west coast of florida ,the keys, and abacos bahamas. Pretty easy stuff as long as the engine works and you have tow insurance. Only insurance I have ever come out ahead on. So have a great time and e-mail me when your around or if you want to pick my brains on any info on local cruising. Hey Chris, thanks for stopping by! The Triangle boats are pretty rare out there-nice to hear from another happy owner. We’re pretty devoted sailors, so the “ditch” is going to be a new experience for us. ‘We heard good things about Fernandina Beach generally, but what’s the anchoring situation? Seems Florida has become pretty antagonistic to non-marina dwellers… And that would be us. There is an endless amount of places to anchor, that is not a problem. I would stay to the north of the mooring field. Holding is good. Fernandina is a great place to stop the one negative and it is a big one, is the two giant papermills right on the waterfront. These are tough to deal with if the wind is blowing your way. The town is at the waterfront so you have a lot of bars, restaurant, showers at marina, laundry, a hardware store, a “freds” which is like a very small walmart. they sell some food but nothing fresh. For fresh food or extensive groceries you will need to go to winn-dixie which is a 2 mile trip. A cab ride is probably $6 . There is also a trolley that travels the island for $3 I think. Goes to the beach, walmart etc.. A couple of other things to mention in considering the stop, we do have a boat yard here if you needed something fixed. I wouldn’t go there if I had a choice only because it is a bit pricey for the DIY person, but it is here and I do use it since I live here. About 3 miles from the tip of the island is Cumberland Island in GA. This is a stop you will want to make. It is a national park, undeveloped island with several good anchorages. Also note the St Marys river entrance to the atlantic is about as good an ocean pass as you can get. 50 feet deep, wide enough for a battleship. So if you get some settled weather and decide to come down the outside you can get into Fernandina safely in almost any weather. If you need anything let me know. GREAT info Chris, thank you! We’re planning g to take the inside route mostly, but it’s good to know the good inlets just in case. And Cumberland island is on our “definite stops” list, thanks! Why would you put the butter in the bildge? Actually in Maine on a boat without refrigeration that’s a perfect spot. Never gets above 65 degrees, since it’s below the waterline. The perfect spreading temperature! So exciting! Enjoy your travels and keep us all up to date! Of course! Stay tuned to this channel! Congratulations! Have an amazing trip! Can’t wait to follow you and copy you someday! Much happiness to you, Keith and Nicki! We were going to sing this yesterday to see you off, but you had so many well-wishers wanting to get a glimpse of you before you slipped out of the harbor, and we didn’t want to interrupt the farewells. So here are the words, and we’ll sing it just for you in May. Been at home in a place far away. And the eastern wind brings a threat of gale. And we’ll meet further on down the road. And a smile breaks the lock on the door. Swapped our tales of woe, kept the clouds at bay. Thank you for that, we’ll hear it when we get back. And many thanks for coming to see us off – that was delightful!